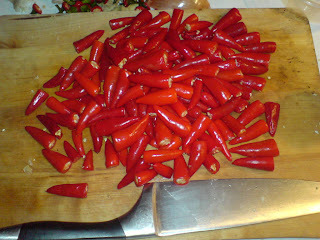 Turned all of these into chili sauce last night. The sauce is so hot it has symptoms. There seems to be a general trend on the internerd summed up by the title of this post. As technologies and techniques come to the mainstream and gain general acceptance they start to look less like toys and more like tools. This means that (some) people start using them well and that people that don't use them so well either stop using them and switch to a more appealing medium or just go away and do something else. Since the rise of FaceBook and Twitter - 2 services on a collision course - there has been a marked downturn in interesting writing on the internet. 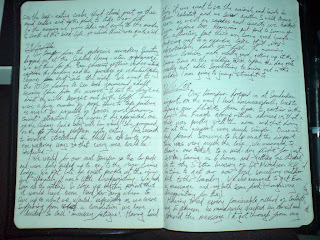 Why write a 200 word blog post when you can do 140 characters 7 times a day and achieve much the same thing? The move of applications like word processing and spreadsheets into the online space and the sheer amount of time people spend using software as a service applications (I use 2 fairly constantly at work) has meant internet use for fun is also regarded less as a toy even though more people are spending more time using it this way than ever before. There also seems a general acceptance that online interactions now have consequences and aren't harmless. Everyone seemingly has heard a story about a FaceBook status setting or picture causing trouble, both apocryphal and true. However both NZ and Australian lawyers can now serve court documents via FaceBook and only last week a man was acquitted when his defense lawyer used as evidence data collected from the arresting officers online social networking activities. The overall effects are by enlarge to make people quality filter what their published online actually activities are, even though they may be doing more, and make sure that there actually are filters in place both incoming and outgoing - activities suitable for a select minority have security settings that restrict them to that community. The incoming filters are also more accessible and more widely applied - if I don't want to hear about your latest move in scrabulous or your last.fm plays I don't have to. However the easy sharing and filtering of information and social activity in established services has meant that the blogosphere is noticeably quieter and startups are more obviously useful. Those who have been doing it a while and doing it well are still around. Those who didn't do it so well or whose heart wasn't really in it seem to have found another way to express themselves that is closer to their hearts. A time of economic downturn is probably going to heighten this effect with money and time being concentrated by service providers on building things that people use and that providers can make money from. The downside of this is that the random elements, the runaway esoteric successes are going to be short lived or quickly assimilated into a bigger entity. The internet is going to be a bit less interesting but more useful for a while, but it really was time for it to grow up again anyway. In fairness to myself it's because they have really wanky marketing which is borderline misleading. I've always resented the way that they are so obviously appealing and disliked the fact that they cost an absolute fortune for what they are, that people that do use them tend to bore me about how good and how useful they are. They are also fetishised by productivity geeks who write in them in different colours for different things and separate them into sections with tabs. What changed my mind? I realised how many notebooks were getting shredded by just being carried around and that was wasting ideas and important notes. I haven't carried or used a paper diary/organiser for more than a year, though this seems to be a cyclical thing. I have had to admit that a Moleskine plus a cover for it has resulted in a big rise in retaining thoughts and ideas - I'm even considering trying the multi-coloured ink thing to see just how annoying it actually is or whether it's a good idea, though I suspect the personal and work aspects of my life would argue about who got the black ink and who got stuck with blue (my neuroses might be too deeply seated to cope with that). The pocket at the back is so damn useful once you get used to carrying the notebook around with you. Business cards in the file pocket - run out of business cards in your other stylish accessories? Oh look a spare! File cards/spare paper in the file pocket - you wouldn't want to tear a page out would you?